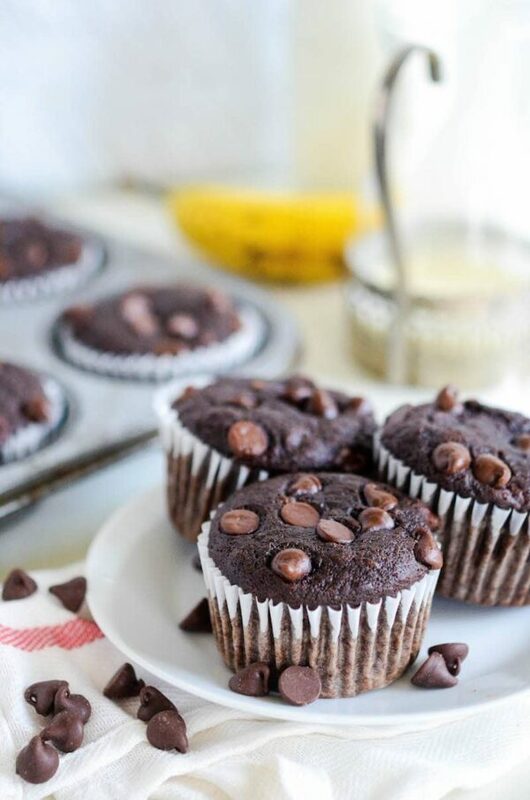 Banana Mocha Chip Muffins: these one-bowl double chocolate banana muffins are loaded with three whole bananas, a ton of chocolate chips and espresso flavor. Chocolate. Bananas. Coffee. What the heck else do you need in a muffin? 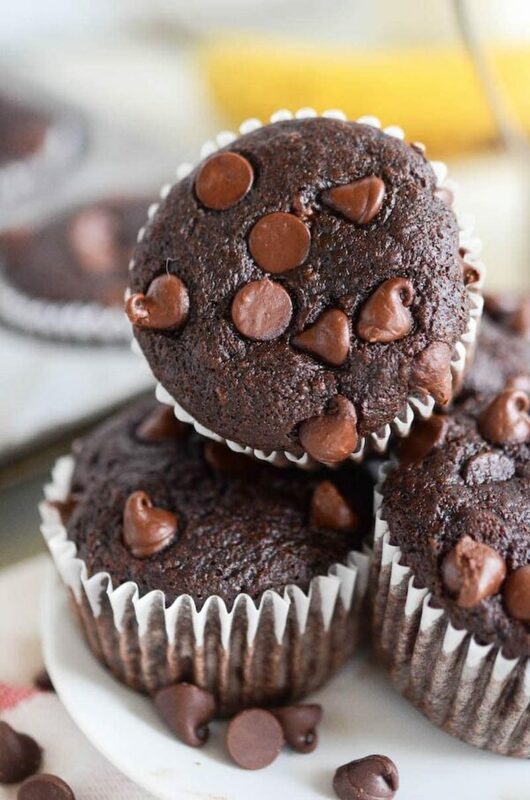 These Banana Mocha Chip Muffins have everything you could possibly need in a breakfast muffin. I was sitting in the kitchen staring at another bundle of bananas that had gone too ripe before we had eaten them. Again. For the 100th time. I have so many wonderful banana recipes, like my favorite Banana Nutella Swirl Muffins, but sometimes you just want something different. So I started tossing things in a bowl. I wasn’t expecting much, honestly. I wasn’t truly paying attention to what I was doing and was just adding a few things together that I thought would go well. Bananas. Chocolate. Chocolate chips. And then I figured, what the heck, I will add a few spoonfuls of instant espresso. If I do say so myself, that was a BRILLIANT move on my part! These muffins are super moist and use up 3 whole bananas. Instead of oil or butter, I used a 1/2 a cup of applesauce. 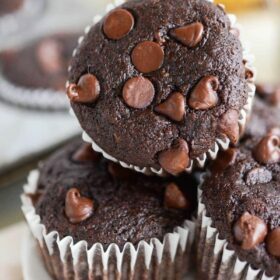 I used both chocolate chips and cocoa powder to ensure a rich chocolate flavor and then you add in the espresso powder. It’s enough espresso powder to help deepen the flavor and richness of the chocolate, while also being just the right amount to give it coffee flavor as well. These Banana Mocha Chip Muffins just might be one of my new all time favorite muffins, and they take under 30 minutes to make! OH! And I forgot to mention, they only take one bowl to make! Yay, easy cleanup!! 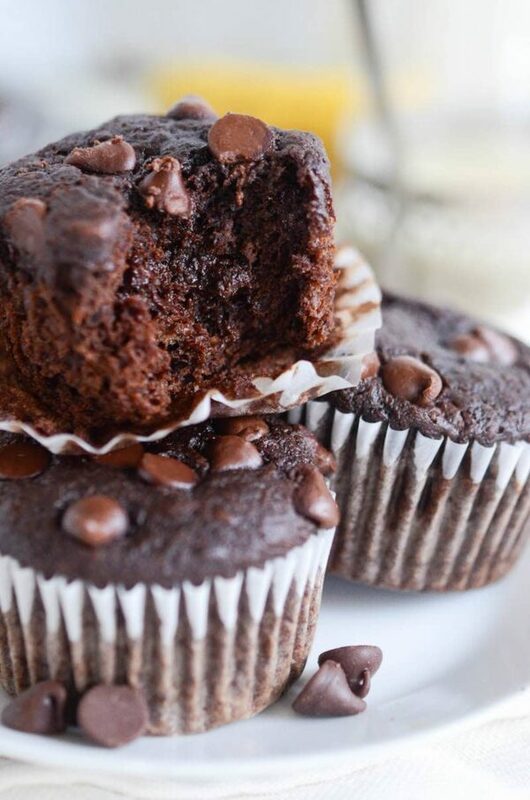 If you aren’t a fan of mocha/coffee/espresso flavored things, you can easily leave out the espresso powder and have some awesome banana chocolate chip muffins too! I hope you enjoy these muffins as much as we do — we will definitely make these again and again! Preheat oven to 350°F. Line muffin tin with muffin liners, set aside. In a large bowl, whisk together bananas, sugar, egg, applesauce, espresso powder and vanilla. Add in flour, cocoa powder, baking powder, baking soda and salt. Whisk until well combined. Fold in 1 cup chocolate chips. 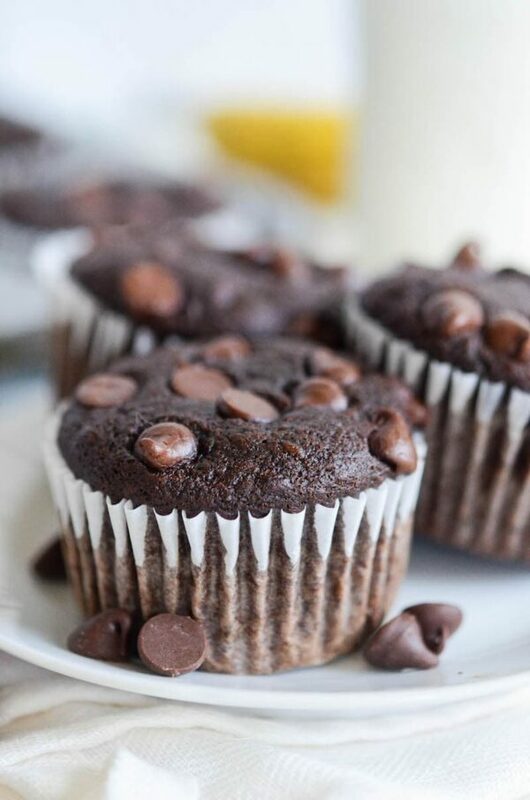 Divide batter among lined muffin cups and sprinkle with remaining chocolate chips. Bake for 16 to 18 minutes, or until a toothpick inserted in the center come out clean. Transfer muffins to a rack and cool. Serve immediately or store in an airtight container for up to 3 days. These look tasty. What kind of cocoa powder should I use, natural or dutch process?